Since we are still very young(lol), we joined a book club for young Orthodox Christian adults. I am super proud of Aaron and I for getting involved at church. We have been seriously slacking on attending liturgy regularly since we have moved :\ but I suppose this is better than nothing, right? So even though we were super tired the Monday night after we got back from Bermuda, we drug ourselves to the young adult book club that was starting at our church. 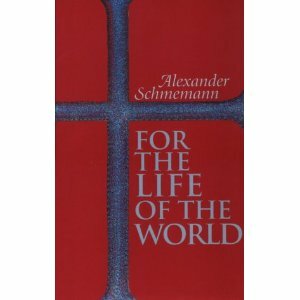 The book we are reading is For the Life of the World, by Alexander Schmemann. "In For the Life of the World Alexander Schmemann suggests an approach to the world and life within it, which stems from the liturgical experience of the Orthodox Church. He understands issues such as secularism and Christian culture from the perspective of the unbroken experience of the Church, as revealed and communicated in her worship, in her liturgy - the sacrament of the world, the sacrament of the Kingdom." This past Monday was our first meeting since we had read any of the book and we got into some really good discussions about things such as materialism in today's society, the function of charity in the Church, and not freaking people out by being 'too religious'. It was really interesting and I thoroughly enjoyed soaking in all the viewpoints. As a newbie Orthodox I feel a little lost in the shuffle of all the goings-on in this faith, but I am learning that even people born into it can feel the same way at times.